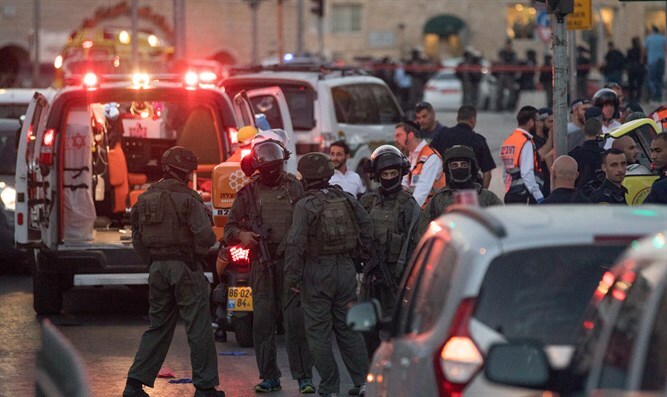 Female terrorist who wounded two near Jerusalem's Old City is indicted by Jerusalem court. The Jerusalem District prosecutor on Monday morning submitted an indictment against Fadawa Hamada to the Jerusalem District courts. Hamada, 29, is a resident of Jerusalem's Sur Baher neighborhood. She is being charged with two counts of terror, each of which include attempted murder and wielding a knife. The attacks, according to the indictment, were in order to allow Hamada to die as a "martyr." On Saturday, August 12, at approximately 11:00 a.m., Hamada woke her husband up, told him she doesn't feel well, and said she wants to go to the doctor. Her husband called a taxi for her. In her purse, Hamada hid a knife with a 12-centimeter (5 inches) blade. This was to aid her plan of murder, and she asked the taxi driver to drop her off at the Old City's Damascus Gate. When she arrived at her destination, Hamada got off the taxi and began to walk to the bus stop. At the same time, a haredi man walked past, on his way home after praying at the Kotel (Western Wall). Hamada took her knife out of her purse, walked towards the man, and attacked him, waving her knife up and down a few times in his direction, intending to murder him. The man instinctively put his hand up and bent over, and the terrorist ended up wounding his left hand. He then began to run, with Hamada running after him with the knife in her hand. After running a few meters, Hamada stopped and turned back, picked up her bag, and continued jogging. When a second person passed, Hamada jogged towards him. When he passed her, she waved the knife at his head and upper body, intending to kill him. In response, the man protected his head and received two deep cuts to his left hand. This man was training to be a security guard for Jerusalem's light rail train, and he pulled out his weapon and ordered Hamada to stop. He then called the police. A few civilians at the scene stopped Hamada, threw the knife from her hand, and yelled for a security guard, who did not shoot her. As a result of Hamada's attack, one of the victims suffered a cut to his left hand, and the other suffered two deep cuts to his left hand and was transferred to a local hospital for medical treatment.